Transition Darebin is all about action. Whether it be related to food, transport, education, community or a whole range of other topics, the key is to lead by example and demonstrate how these changes can be made. We’ve got a load of projects up and running so if you see something that interests you then get in touch. But there’s always new ideas out there so if you’re looking for a project that doesn’t appear on here or if you have an idea that you’d like to see happen in Darebin then check out the idea seedbank or get in touch with Transition Darebin and let us help you make it happen. Description: This group organises fun activities, tours, workshops and stalls, with the side benefit of raising funds for local projects. How you can help: organise a once-off event or join the crew! Description: Food swaps are a great way to share excess food and also get your hands on some home grown goodies. 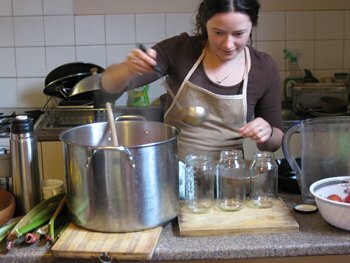 But there’s loads more to the food swap than just food as we exchange seedlings, recipes, preserves as well as gardening advice and some wisdom about how to make your garden grow even better. 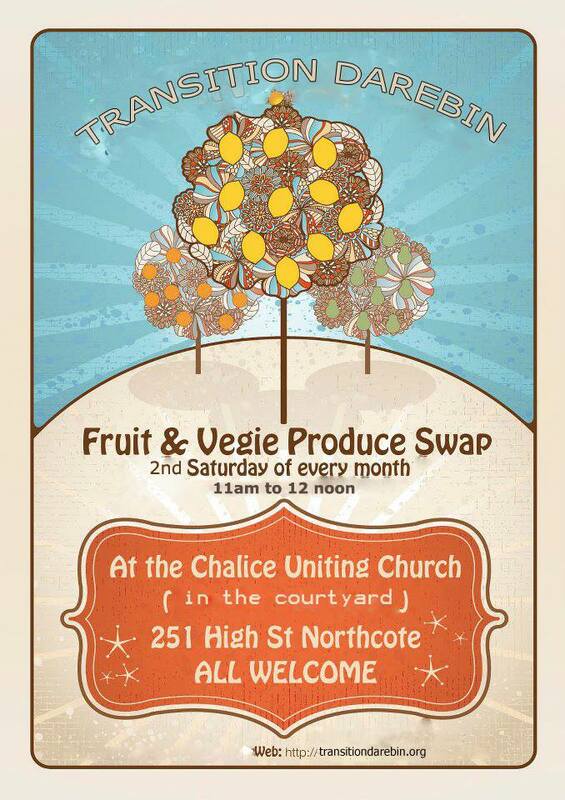 Our main food swap occurs on the 2nd sunday of each month from 10-11am at Chalice, 251 High Street. To get the latest information check out the There are food swaps happening in Northcote and Preston. For all the current details, check out the Darebin Urban Harvesters on facebook. How you can get involved: Just come along. If you have any excess produce you want to swap bring it along but if not by all means just come and check it out! maintaining fruit trees, in return for their surplus fruit. How you can get involved: For new volunteers, register your interest by emailing fruitsquad@divrs.org.au We look forward to meeting you! Description: Our Apple Tree is a small community space where people can reclaim thir open urban space in the shade of a 50 year old majestic apple tree. This is also a demonstration space about what can be done in a degraded site like this one that has been used as a railway staging area and dump. We hold workshops and ‘tree bees’ on the second sunday of each month to not only improve the space but also demonstrate low cost transition technology like wicking beds, vertical gardens, pallet furniture, compost hubs and loads more. How you can get involved: Just come along to one of the workshops or check out Our Apple Tree Herbert Street on facebook for the latest news. Description:In times gone by commons were shared public spaces that were held for the public good. Whether it was a place that goats and cows could graze or a grove of nut trees that would be harvested by the whole village, the common filled the gaps of food production and also provided a focal point for the community. The Croxton Common is envisaged as just such a place (though maybe without the cows!). But we know that waiting until such a place is required will make it ten years too late we have to start now! This project involves the development of open space around the Croxton Railway station into a community driven area involve urban orchards, recreation, education and engagement spaces. How you can get involved: We are always on the look out for people who want to be actively involved in making this spaces an amazing one. For more information keep an eye on the TD website or to go on the mailing list contact Paul. Description: Transition Towns, meets pizza and beer. Transition in the pub is a monthly event held in a local venue where we showcase new ideas, new projects or just interesting and inspirational accounts of what is going on in our neighborhood. It’s a laid back social affair and always a laugh. How you can get involved: We’re always looking for people who have stories, interests or skills to present so if you’ve got something that you want to share then let us know. We also need people to organise, publicise and support the events themselves, so if this sound more like your cup of tea then again let us know. Description: This initiative is all about telling busting out of the throw-away culture and actually fixing things that are broken. We don’t claim to have all the answers but this group is about giving it a try with some words of wisdom and a supportive bunch of people to help. So if you think that things should be glued, nailed, soldered, darned, stitched or buffed back into existence rather than thrown away then this is a group worth checking out. How you can get involved: This group meets monthly in Preston and is always interested in welcoming new members. If it sounds like something you are keen on then give Cath a call.